Spray directly onto a cotton pad and swipe across clean skin every morning and/or evening. Allow skin to dry before applying other products. Follow with recommended serums, moisturizer and sunscreen. Ideal prep to enhance mask and serum penetration. Good cleanser. If I use with toner it tends to be to drying for my combination skin. I use it at night only and I know skin is very clean and ready for serums. I use Benefit Clean in the morning. I switch between these 2 cleaners depending on how my skin feels. I absolutely love Purity Balance! It really reduced my shine. I have been using cosmedix for about 9 years now and have fallen completely in love. I started with Purity cleanse and over the years I've added more cosmedix products to my regimen. Thank you for a great line of products! I really like this product. Leaves my skin feeling refreshed and not stripped or dry. Would def buy again. This product helped my skin clear up almost immediately. The scent is a little strong but not bad. Would definitely recommend. I love using Purity Balance and use it daily. It tones my face and helps me keep clogged pores at bay. I highly recommend it for others who have oily skin. I have been using this product for years. When you find a product that works I believe you stick with it so now I am trying out other Cosmedix products to pair with it. This brand is amazing and does very well for my skin. This toner feels amazing when it’s drying. Your face feels clean and fresh. As others have stated I will have already cleansed my face with either purity clean, purity solution, or both and this toner will still pull dirt and oil from my pores. I can’t tell whether it has made a difference yet as I’ve still had breakouts but I’m hoping it does. Also yes it does have an extremely strong scent that can’t be inhaled without coughing. I don’t mind it, I just hold my breath for a few seconds, but I know some people wouldn’t care for that. I bought this cleanser for my sons to help clear up their acne. So far, it’s doing a nice job. It thoroughly cleans, but is not too drying, and their skin is already looking calmer. Even I have used it a couple of times now, and I really like the way it feels. It does a great job of making my skin feel soft and smooth, but not overly dry. I like the exfoliation I get from the Salicylic Acid. It’s not too harsh. It has a nice minty smell to it. Overall, I am happy with my purchase, and would recommend and buy again. I’ve been using this toner, along with a few other Cosmedix products, consistently for almost a year now and it has helped my skin so much! My skin is less oily throughout the day and feels MUCH cleaner after using it. I have also had significantly less breakouts and acne problems, which is the main reason I started using this toner in the first place, so I would highly recommend this product to anyone! Definitely recommend this product. It is light but does a good job cleaning. The scent is not too strong which I like. Pairs well with the gentle cleanser and my skin feels great afterwards. My esthetician used this product on me a few years ago and I have been a huge fan ever since. This toner does wonders to my oily, acne prone skin. Highly recommend! Favorite item EVER!!! Cleansing, refreshing and best cleanser I’ve ever used! Can be used as a mask treatment if needed. I use everyday and does great with other products you’re using. Love this toner. I feel like it cleans my skin without drying it out. I would recommend this to anyone! I’ve been loving this toner! I get breakouts on my cheeks and since using this along with the purity cleanser my breakouts are few and far between! The only downside is this does make me cough every time I spray it. This cleanser is AMAZING and I love that it works deep down to thoroughly clean dirt and debris but isn’t harsh on my skin. Feels like a mini peel after cleansing. So far, so good! Removes any dirt/makeup left after cleansing. It is my must-have all the time. My skin is oily with acne. The acid in this product helps reduces the oil and calm down acne. But sensitive skin might need pay attention since the acid concentration is higher than most of the other products. By the way, I really like the new package. The pump stays clean all the time. I ordered a few items from this collection and haven’t noticed any difference yet in my skin, but the smell is very strong in this particular product. To the point it burns my nose, I would probably look for another toner in their line once I am out. Wipes away dead skin after washing my face that I never knew was there. Love this product. Perfect for every day facial cleaning. Very gentle on the skin. I really like this product. It has been few weeks since I first used it and the best part for me is that only one spray is enough for whole face, so the bottle is definitely enough for a long time. It has a strong scent which reminds me of medical products, but goes away within 5-10 min. I have only been using this product for about a week or two, but I think it's working great. I got introduced to Cosmedix through a spa where I get facials. This toner really digs in deep. I'm always in shock with how much dirt still comes off of my face even after washing. Excellent product! This is my number one must-have product. Nothing cleans and exfoliate my face like this. It is also surprisingly moisturizing! My 15 yr old son and I both use this product. After washing with benefit cleanser or purity clean, this product helps exfoliate and clean just enough. Makes my face feel fresh, super clean, and ready to apply my other products. This product has been amazing, been using it for years. I use it twice a day and rarely have any breakouts. This product is amazing . My skin feels very fresh after every use and keeps my skin smooth. I see dramatic changes in my skin. I have really oily skin and these products have really helped me control the oil. I’m really excited to see what the next 6 months holds since I’m using the whole line of products. Cosmedix is bomb! I’ve been using this product for about 2/3 weeks now. My skin is a lot clearer, softer and my pores are much less noticeable. Wish it had a better smell. 10/10 would recommend to a friend! Great product! I ordered purity balance along with purity clean and I noticed a significant difference in my skin. My pores appear much smaller. I’ve also noticed that the congestion around my nose has almost disappeared. This is an excellent product to thoroughly clean your skin and prep it for additional products. Best facial products on the market I have been using them for over 10 years. LOVE LOVE LOVE them! I’m very pleased with the whole line of Purity products. I’ve used the Benefit products as well. I love the fresh feeling after cleansing and then toning with Purity Balance. I had a skin irritation around my nose area and started using purity balance; it cleared up within 3-4 days. It has a strong smell when you first spray it but it dissipates quickly. Will reorder and continue to use. Great results for me ! I recently started using this spray, about 3 weeks now. Im shocked. what ever it is doing to my skin I love it. I noticed my pore's on my nose are smaller. (no Joke) I use this every night and usually once during the day. To see such a huge difference in my pore's is still amazing to me. I started using the benefit clean and balance before using purity clean and balance, then I started to use the purity at night. Honestly, my skin likes the purity so much better. My face feels more clean and refreshed after using purity. I may just start using solely purity. The minty scent and feel definitely add to the clean feeling, and especially with the pure enzymes mask, they both work wonders together. Like the description says, the purity balance is actually a really good exfoliating prep. Now I know from experience. I would recommend this product along with the purity clean and pure enzymes if you have oily skin. Personally, my skin care regimen looks like this: Morning - purity clean, purity balance, (may try sticking pure enzymes in here? ), clarity serum, phytoclear (which I think is a little heavier than I'd like? thinking about trying mystic), and pure c with reflect. 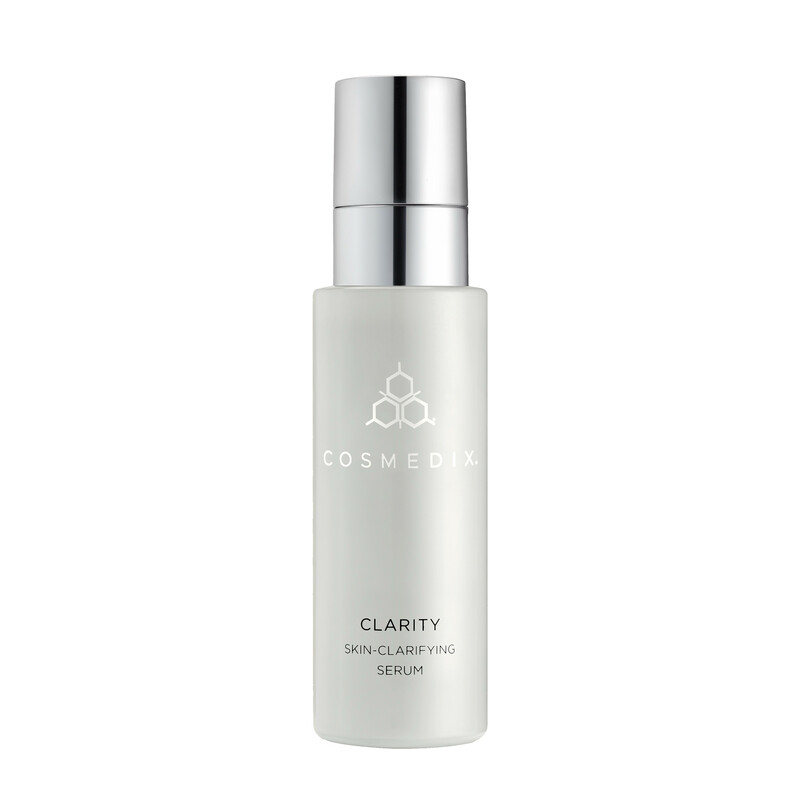 Night - purity clean and balance, pure enzymes, purity balance, clarity serum, alternate defind and refine, and pure c with phytoclear. I love the Cosmedix products but have been frustrated by some of the packaging in the past. I'm thrilled that Cosmedix did some upgrades, but the packaging for this product is actually worse than the previous packaging. The spray that comes out is too fine making it difficult to saturate a cotton pad or cotton ball as much of the product just gets aerosolized. To remedy this, I end up holding my cotton pad right against the nozzle, but then the silver paint on the package starts to flake off. I have now poured my product into a different spray bottle that is much more serviceable. I hope they figure this out and fix the packaging for this product.Having said that, the product itself is great! I am in my fifties and I love this stuff. It helps to normalize my combination skin, minimizes pores and redness and is a great prep before doing a mask or putting on a serum.